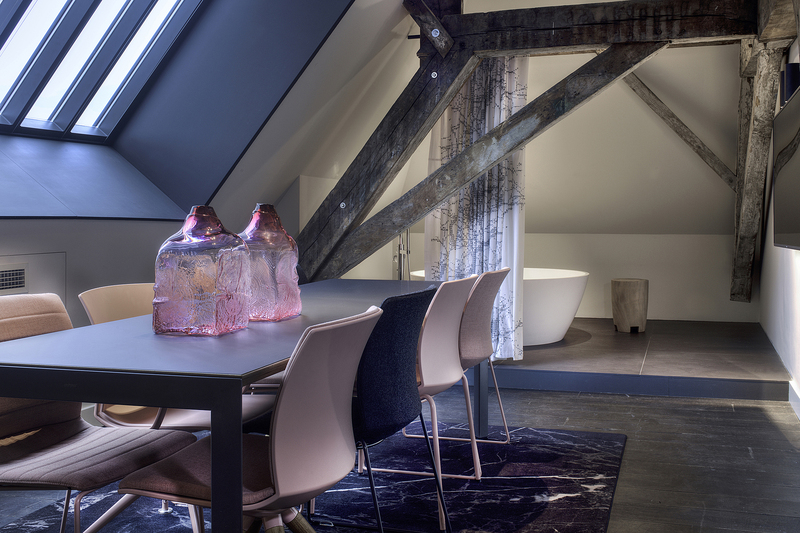 The 140sqm (1,506sqft) Penthouse Loft has an amazing rooftop construction, complete with its original wooden beams ( note: the inscription from 1855), an iconic welded Protopunk Chess Table and a telescope to gaze at the stars at night from the skylight. 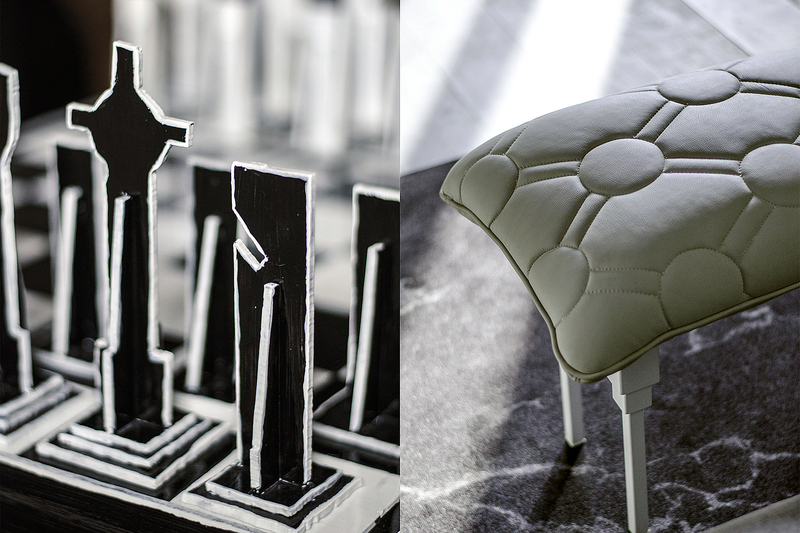 Sleep and wake up surrounded by topical works by top-talented designers? 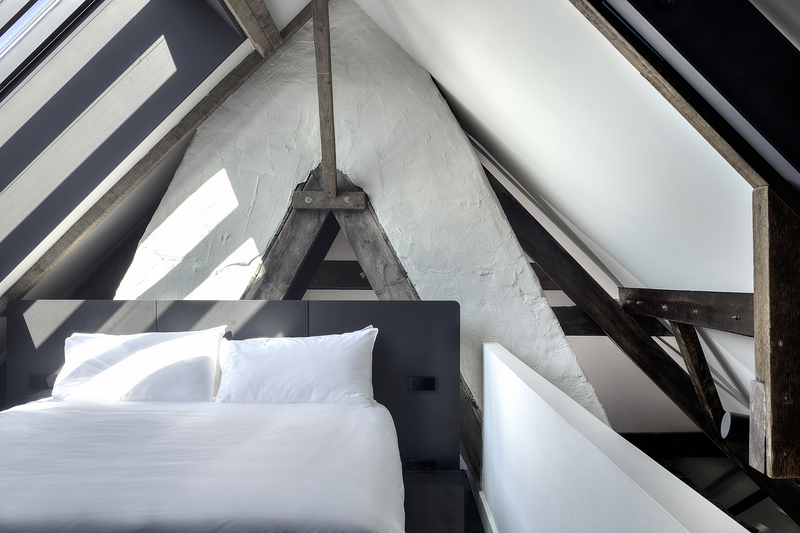 Kazerne host 8 luxury rooms, suites and lofts ranging from 35 up to even 140 square meter. As a guest you are a highly valued temporary member of our exclusive members club. This means you’ll be able to enter our living room with honesty bar 24/7. 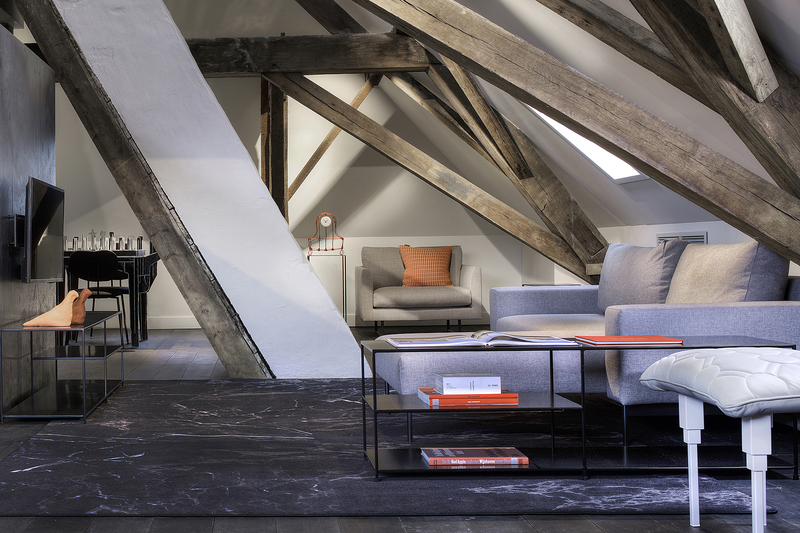 The 140sqm (1,506sqft) Penthouse Loft has an amazing rooftop construction, complete with its original wooden beams with an inscription from 1855. The main area feels like open-plan living, even though there is a separate sleeping room and bathroom. In the open-plan area, there is a large freestanding round bathtub and the enclosed bathroom includes a rain shower, basin, toilet and bidet. The living area has a comfortable sleeping couch and a lounge chair. The area under one of the skylights contains a large table that sits up to eight people for a dinner, working or a meeting. There is an iconic welded Protopunk Chess Table and a telescope to gaze at the stars at night from the skylight. The main sleeping area is on the mezzanine. The corridor has a closet designed by Daphna Laurens. The fully equipped kitchen contains an oven, stove and sink, refrigerator, kettle and real Italian espresso from Jolly Caffè (Florence). A selection of beverages including champagne by the independent family brand Veuve Fourney et Fills and organic beer by Gulpener is offered in the minibar/refrigerator. Complimentary fruit and a welcome surprise are included.